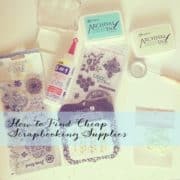 Happy Wednesday paper crafters1 I’m so excited about Memorial Day this weekend. Memorial Day always feels like the “un-official” start of Summer to me. It means that it’s time for bar-b-que’s and pool parties. I’m bringing you a free printable pinwheel today. 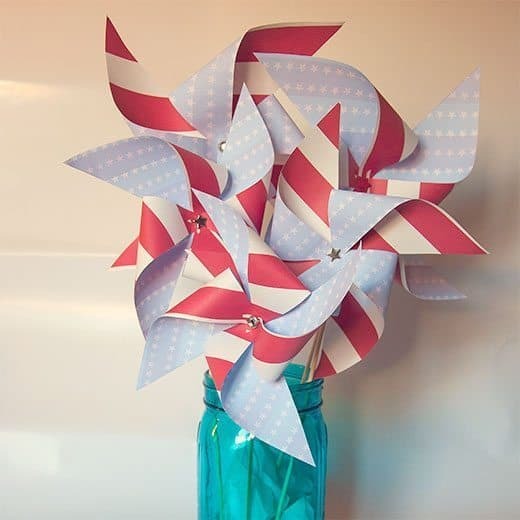 This DIY Memorial Day Pinwheel is fast and easy to make and makes a great decoration for your Memorial day or even Fourth of July party. Making the pinwheel is simple. First, print it out. There are two sizes included one large 7″ pinwheel and a smaller 5″ pinwheel. You want to print them double sided. I made the striped side slightly larger than the other side just in case your printer prints a little off like mine does. Once you have everything printed, cut it out following the blue sided template. Make sure to cut the diagonals as well. Punch the holes where shown and secure them to the center using a brad. If you don’t care about the pinwheels actually spinning you can just hot glue it to a dowel. If you want your pinwheels to spin nail them to the dowel. I hope everyone enjoys the long holiday weekend. Hopefully the weather cooperates so everyone can have some fun in the sun. This printable file is free to use for all of your fun paper crafting and home decor projects. If you liked this file you might also like our printable Memorial Day scrapbook paper. You can use the paper with the pinwheels to create a unique decoration for your party.